A debut short story collection that delves deep into the gritty, idiosyncratic world of the American prison. The Graybar Hotel dazzles with humor and insight even as it describes a harsh existence: long-term incarceration, told through the prism of a collection of precisely observed short stories. This is not a picture of endless brutality but, rather, a multifaceted exploration of the lives of incarcerated men and the ways in which they struggle to retain their humanity in near impossible circumstances. Taking us from county jail to release and probation, The Graybar Hotel is a profoundly moving collection, giving voice to some of the most overlooked members of our society.? •an Honoree in the Society of Midland Authors Annual Literary Award competition. "[Dawkins's] prison stories are insightful and well written, and they ring true. Dawkins possesses the acquired wisdom of a man who's been there, done that and, unfortunately, is staying there." "[A] book that is remarkable for its modesty, realism and humanity ... Dawkins has a genius for bringing characters to life and making mundane situations compelling, if only because they feel so real ... [Dawkins] has produced a book that is not only moving and genuine, but genuinely important; one that, without resorting to shock tactics, powerfully conveys the perverse inhumanity of mass incarceration." "Dawkins brings us real news and art, employing strange conceits—inmates collect-calling strangers, or preparing for an intramural softball game, or acquiring the ability to disappear—to expose prison's most powerful weapon against minds and bodies: not violence, but boredom." "Reading The Graybar Hotel is as close as most people would ever want to get to going to prison. Dawkins’s characters are as indelible as the prison tattoos he describes with wry precision, from Depakote Mo to Doo-Wop to Jonnie Mae. The clichés about prison life—cigarettes as currency, strained race relations, a lot of television watching, and occasional violence—are deftly skirted here as Dawkins plays with the claustrophobia of his characters’ condition by moving in and out of their lives before and during incarceration. Dawkins, who is serving life without parole for murder, is a formidable new talent." "This short story collection explores the life of prisoners with both intoxicating and unparalleled insight and surprising humor." "[A] powerful collection of stories about how inmates survive and struggle in prison." "A Western Michigan University MFA graduate serving life for a drug-fueled 2005 Kalamazoo murder, Dawkins chronicles the occasionally colorful, often despondent and mostly tedious lives of contemporary inmates ... Dawkins writes empathetic, thoughtful pieces about those who long for the outside." "A well-turned and surprising addition to prison literature." "In stories that range from high-definition realism to wistful surrealism, Dawkins illuminates the nuances of prison life from the fragility of inmate friendships to the constant assault of memories and regrets, sensual deprivation, the intricate web of lies and power plays, and the many shades of stoicism. Sorrowful, hard-hitting, and compassionate, these finely formed, quietly devastating stories are told with unusual and magnetizing authority." "Dawkins’s tales impress with the authenticity of real-life experience, and his prose is rich in metaphor and imagery ... His often wryly amusing observations about the routines of prison life make him a striking guide for navigating the terrain." 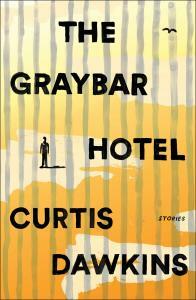 "In The Graybar Hotel, Curtis Dawkins brings the contemporary short story at its best into the shadowy world of America at its worst, behind the bars of its overpopulated and ubiquitous prisons. These brilliantly crafted stories – with their formal inventiveness, savory dialogue, meticulous detail, and succinctly compassionate portraiture – are as much a manual in how to write original short fiction as in how to think about prisons. Still, anyone who wants to understand America’s correctional system through the clarifying lens of great fiction will now have to know three indispensable books: Malcolm Braly’s On the Yard, for the social novel; Chester Himes’ Yesterday Will Make You Cry, for the bildungsroman; and now Curtis Dawkins’ The Graybar Hotel, for the short story." “Curtis Dawkins draws from his direct experience to paint a picture of jailhouse life in all its grimness. He conveys the repulsive mixture of boredom, stupidity, filthiness, meanness and chronic anxiety that is the prisoner's lot. The inmates are dysfunctional, the structure that houses them authoritarian. This book will scare you straight—or should. But within their cages, Dawkins' prisoners dream—of criminal schemes, drugs, women—and an American world outside the walls. Their avid fantasies burn with a furious light against the bleak institutional background, exploding with ingenuity, pathos and rebellion. In many cases, these outsiders are, like Dawkins himself, artists.